Pooja Ramachandran, a popular VJ in SS music is making her dream debut in malayalam through 'Lucky Star' directed by Deepu Anthikad. Pooja, who had already appeared on big screen with Kathalil Sodhapavadu Yeppadi (Tamil) and Swamy Ra Ra (Telugu), is excited to work in malayalam which stars Jayaram and Rachana Narayanankutty. Pooja Ramachandran is not so unfamiliar to South Indian television viewers, especially those who are born addicts of Tamil SS Music Channel. Known as a popular anchor, Pooja had been in the limelight for the past few years. Passion towards beauty pageants had rewarded her with Miss Coimbatore 2004 and Miss Kerala, Second Runner up 2005 titles. After making her presence in small screen, Pooja landed in the playhouse of entertainment lending her face for movies Kathalil Sodhapavadu Yeppadi (Tamil) and Swamy Ra Ra (Telugu). The actress who admires Sharukh Khan and Julia Roberts is the new talk of the tinsel town after getting casted in 'Lucky Star' directed by debutant Deepu Anthikad. Riding high standing on cloud nine, Pooja Ramachandran will don a prominent role in upcoming malayalam movie 'Lucky Star' which will feature Jayaram and Rachana Narayanankutty in lead roles. The theme of the movie is centered on the life of Ranjith (Jayaram) who aims to become a rich man. To become billionaire, Ranjith foresee two ways; take lottery tickets or to become a movie star. Falling too short of his dreams, Ranjith meets junior artist Janaki (Rachana Narayanankutty) and their friendship later ends up in marriage. Ranjith and Janaki who were not ready to compromise other than becoming rich thought of another plan. The idea was to think about surrogacy- an arrangement in which a woman carries and delivers a kid for a different couple or individual. Moving forward with the idea, Ranjith and Janaki meet Dr Joseph Chittilappally, an infertility specialist and share their purpose of visit. But what they expected didn't carry out as the couple land in trouble finding no way to get rid of it. The movie travels through funny events which are to be followed later. Produced by Milan Jeelel under Galaxy Films, 'Lucky Star' would be the directorial debut of Deepu Anthikad who is much familiar for creating spectacular advertisements for various brands. 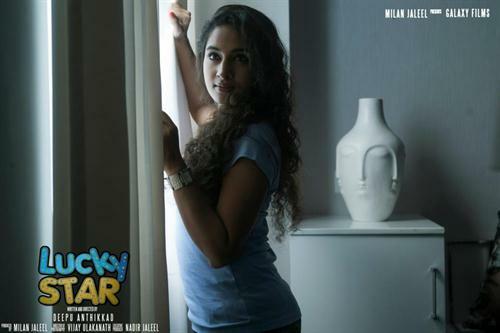 'Lucky Star' would be a perfect platform for Pooja Ramachandran to show her acting skill on big screen. Lucky Star malayalam movie featuring Jayaram in lead will be the directorial debut of Deepu Anthikad who steps into movie industry with an experience of working behind the camera as an ad film director. Coming with the tag line ''Seriously humorous', the movie will have Rachana Narayankutty as one leading lady. Produced by Milan Jeleel, Lucky Star will be blessed with the majestic composition of Ratheesh Veega. Read more to know about Lucky Star. 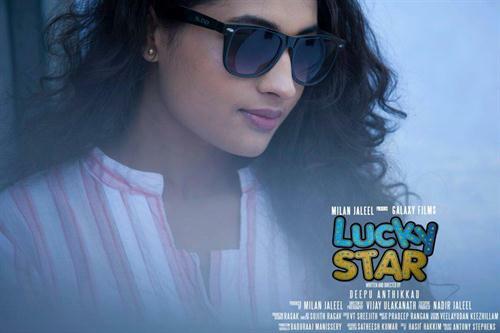 Lucky Star malayalam movie review and FDFS reports from theatres in Kerala are given here. Directed by debutant Deepu Anthikad, the movie which reached theatres on 8th March 2013 is truly a visual treat for the movie lovers who do give too respect to time. The movie stars Jayaram, Rachana Narayankutty, Mukesh and Pooja Ramachandran.